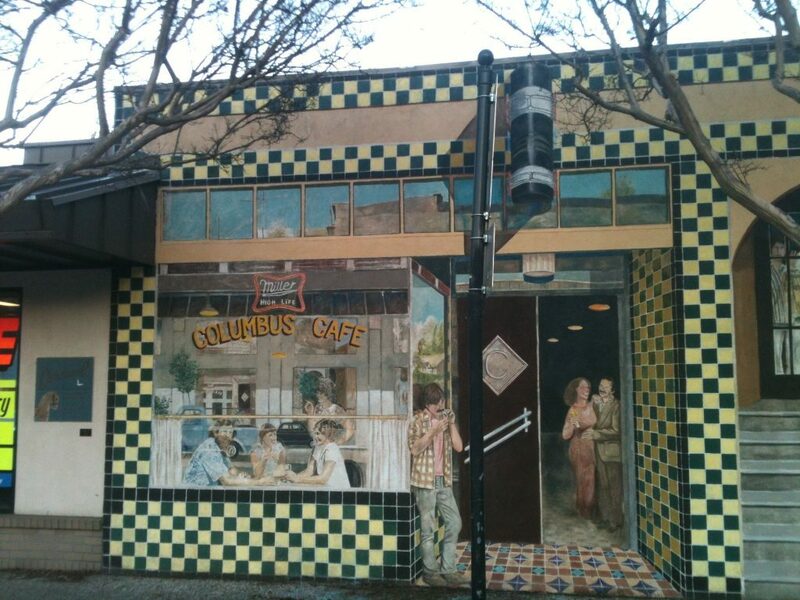 “This mural of San Francisco’s Columbus Cafe in North Beach, painted by Terry Buckendorf. This mural was restored in 1989, and again in January 2013, due to the mural’s extensive water damage. Although the mural’s image is of a San Francisco location, the placement of several prominent Davis residents, and the historical nature of the mural has made it an endearing and enduring addition to the downtown area. Restoration was funded by the City of Davis, and took place in 2013, by Kerry Rowland-Avrech. After the restoration, the John Natsoulas Gallery placed a high-grade varnish to protect the mural. According to Ken Kemmerling, the guy lighting the cigarette is the artist, Terry Buckendorf. David Rubinstein was an original model for the mural, but was replaced. The women in the main window are: Andrea Bennet, Kathy Kopp & Gloria Seaborg (Terry’s partner at the time). Terry & Gloria lived at 412 Second Street with fellow artists Steve Kaltenbach, Paul Biehler & Julie Partansky (who is peering out of a window on the right side of the mural) until March 1, 1976. Gloria was co-founder of Newsbeat, and later moved to Seattle. No one is sure of the identity of the guy with the beard sitting at the table.